Proprietor and winemaker Sean Capiaux has a degree in enology from California State University Fresno and has a notable career as a winemaker working at Jordan, Pine Ridge and Peter Michael in California, Macari, Jamesport and Schneider in Long Island, New York, and Houghton's in Australia. 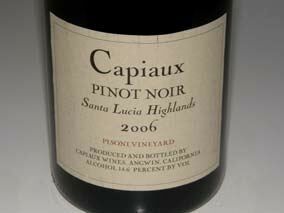 He started his own label, Capiaux Cellars in 1994 and also is the proprietor and winemaker for O'Shaughnessy Winery, a producer of Cabernet Sauvignon in the Howell Mountain appellation of Napa Valley. 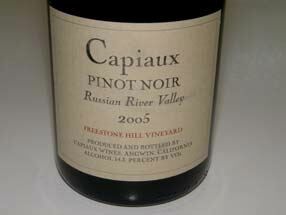 Capiaux currently produces five vineyard-designate Pinot Noirs from Garys' Vineyard and Pisoni Vineyard in the Santa Lucia Highlands, Wilson Vineyard in the Sonoma Coast, and Widdoes Vineyard and Freestone Hill Vineyard in the Russian River Valley. An additional Pinot Noir, Chimera, is a blend from Sonoma County. The wines can be purchased online and through limited retail distribution. Mailing list members are guaranteed the best opportunity to obtain the wines.